In a recent post (New Locations Offer a New Twist on Offshoring Legal Services), I highlighted the growing geographic breadth among Legal Process Outsourcing (LPO) vendors. Geographic breadth helps vendors distribute their operational risks and costs while providing access to a wide range of talent. Another measure of a vendor’s “breadth” is the range of services it offers. As illustrated in the diagram above, vendors providing LPO services cluster into three major categories along a wide “services breadth” spectrum. 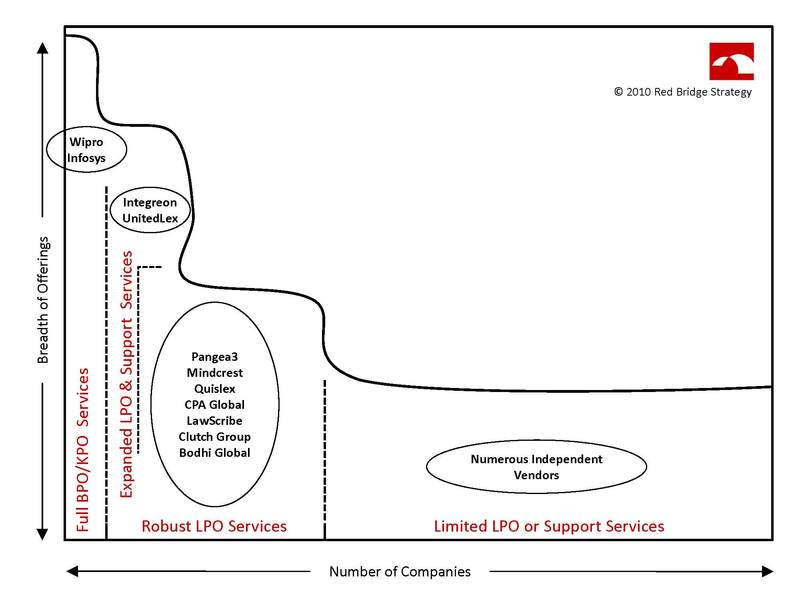 They range from very small companies often focused on a single LPO service area (or those with only a tangential LPO offering), to others offering a full set of LPO services but little else, to those offering not only LPO services but a suite of outsourcing services that may include other Knowledge Process Outsourcing (KPO) services (LPO is considered a specific type of KPO service) or even generalized Business Process Outsourcing (BPO) or Information Technology (IT) outsourcing services. Of the reported more than 140 LPO vendors, the vast majority are very small companies that offer little more than basic legal or support services. There are also some small companies with niche offerings, such as IPEngine, which focuses on intellectual property, or Global Colleague, which offers Chinese legal support services for western clients from Taiwan. The mainstays of the industry, such players as Pangea3 and Mindcrest, offer a robust set of legal and support services. The largest vendors offering LPO services, companies like Infosys and Wipro, offer a wide range of services but have not (yet?) focused their formidable assets on the legal services market. Emerging between the industry mainstays and the largest vendors are a few legal services vendors that have begun to address the market for ancillary services to law firms and legal departments. In addition to a full range of LPO and legal support services, both Integreon and UnitedLex provide finance and accounting specifically for legal departments. While numerous BPO vendors provide finance and accounting services, these vendors have focused on the issues specific to law firms such as the need for client-specific billing details and formats. In addition, Integreon has recently launched outsourced library services. According to the company, its “Bristol-based delivery centre is staffed with experienced information professionals who deliver the high quality services clients need at a cost savings of 20 to 30% compared to London rates.” Expanding in another direction, UnitedLex has begun offering Human Resources outsourcing to its legal clients. Legal organizations undertaking strategic reviews should consider their overall sourcing strategies and how these vendors and services fit into future plans. The evolution of ancillary outsourcing services is likely to differ significantly for law firms than it will for legal departments. Law firms will have an opportunity to focus their skills and capital on the legal advice that will bring them competitive advantage while allowing vendors or partners to provide back office and, what will become, commodity legal services. Corporate legal departments will also benefit from legal-centric vendors services, but will be much more likely to source non-legal ancillary services, such as finance and human resources, from the generalized vendors that serve their corporations as a whole. As technology and productivity have advanced, it has become easier to separate the components of the services that legal professionals provide, resulting in each service component being subject to its own set of market forces. These are the first steps to developing an efficient and highly productive market where highly skilled lawyers can command premium prices for their capabilities while standardized and commoditized services are priced in accordance with their value. Ultimately legal services consumers should spend less while receiving overall higher quality legal services. This entry was posted on Tuesday, January 12th, 2010 at 6:59 pm and is filed under Uncategorized. You can follow any responses to this entry through the RSS 2.0 feed. Both comments and pings are currently closed. Great article. Thanks for this great information. I know lot will like this article. Nice read. I like the representation of service providers in the diagram. You mentioned some of the providers are expanding their service offerings to include support services. Right now, probably there are 4-5 such players. Do you think many more providers will join this group? Thanks for your question Neeraja. I differentiate between what I call support services, which include such services as word processing and transcription, as compared to ancillary services, which include such services as accounting, human resources, and library services. The difference is that ancillary services are higher value services requiring higher skilled workers and managers. By these definitions, support services are already prevalent offerings among LPO vendors, and I expect that to continue and expand. With regard to ancillary services, I expect this to be a fairly small group. I anticipate that the LPO market will consolidate leaving fewer vendors in the mainstay category. Of these, some will grow to include ancillary services and some, as part of the consolidation, will become part of larger vendors that already offer ancillary services. As a result, there will be a few more vendors offering ancillary services, but some of the current vendors offering them may be consolidated out of existence. Maybe the larger KPOs and BPOs will be in a much better position to offer ancillary services. Thanks Matthew!